I think of blogs as the Internet version of reality TV only better. You have all sorts of possible scenarios as the basis for the blogs and you have hundreds of thousands of cast members, contestants or participants all sharing their particular “slice of life.” Some are informative, some are poetic, some are humorous, some are visually stunning, some are boat-rocker. And some are the commercials. We get to choose which ones we’re willing to spend time looking at. Which ones entertain us? Just like reality TV, some are 100% disgustingly moronic and you would never be caught dead reading them, yet others love them! And some are so well-loved they become national favorites. You can discover these hidden gems by surfing the Internet or surfing the WordPress topics bar. But the best way to find great blogs is by “Word of Keyboard.” This is when a blogger writes about or recommends the wonderful blogs that they enjoy. And often there is an award involved. 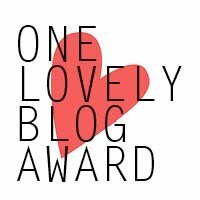 Thank you so much, Amy, for sending the One Lovely Blog Award my way! I think your Afternoon Popcorn Snack is exceptional. Just the other day I marveled at your Watermelon and Fresh Basil Margarita recipe. I don’t drink margaritas but I’ve got to try this because it sounds so so good! And thank you for the wonderful recommendations for other great blogs to check out—that is a prize in itself. 1. I know the true identity of Coffee Man. (Check back on Wednesday when I reveal that.) 2. I fantasize about being a female vocalist in a band yet I rarely sing in front of anyone. 3. I think Daniel Craig is giving Sean Connery a run for his money for being the best 007. 4. I listen to an AM Oldies station in the car because I know the words to those songs and yes, I do sing them. Out loud. 5. I am a founding member of a sorority my college friends and I made up in our freshman year. (Phi Gamma Tau only it was spelled Fi Gamma Tau and the motto was “Anything for a Fi”) There were five members. 6. I love garlic and I advise that anyone around me can protect themselves by simply eating lots of garlic also. 7. I make up games and get other people to play them with me. This entry was posted in Blogging, Friendship and tagged "like", Blog, Daniel Craig, One Lovely Blog Award, Reality television, Sean Connery by mycookinglifebypatty. Bookmark the permalink. Patty, I really enjoyed this. Very fun. I smiled and laughed out loud several times. Thanks. Thanks Brian! I just re-read it myself to see what I’d said and I was smiling too. You are very welcome! Love checking in to your blog. Thank you so much for the addition to your blog! So fantastic of you to include me and my humble blog!! 🙂 I also have a lot of time for garlic in my life – often to the peril of others. So I’d vote YES to everyone in the world having a similar addiction, that way they won’t notice mine! Wow, thanks for the nomination Patty!! 🙂 Such a lovely surprise to come home to after being at the cottage for the weekend! Well, this is going to be like Christmas! AWWWW Sweetie THANK YOU! I still have not done another one I was tagged with so I better do that and then I can answer yours YOU ARE AWESOME SAUCE! Wow! You are Award Rich! It was like back in April when the world kind of came crashing down around me with getting sick and having my domain host over at Cabin Goddess go rogue and evil on my rear end! Wow. Hope things are getting straightened out there! Never thought of that – but so clever and true – that blogs are like TV shows! I often think about what motivates us all to scribble away :-). Congratulations on your award and thank you so much for including mine! Woohoo! You are welcome! Do you sing in the car? Thanks! And I see I missed something . . . you were supposed to be on there but I had lots of trouble getting this thing to behave today! You’re welcome! It is well-deserved.